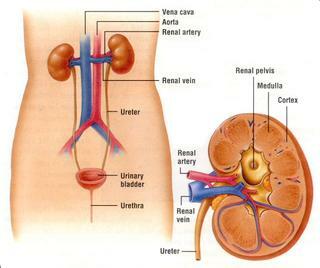 Cancer that forms in tissues of the bladder (the organ that stores urine). Most bladder cancers are transitional cell carcinomas (cancer that begins in cells that normally make up the inner lining of the bladder). Other types include squamous cell carcinoma (cancer that begins in thin, flat cells) and adenocarcinoma (cancer that begins in cells that make and release mucus and other fluids). The cells that form squamous cell carcinoma and adenocarcinoma develop in the inner lining of the bladder as a result of chronic irritation and inflammation. These symptoms can also result from other conditions such as a bladder infection, a benign (non-cancerous) tumor, kidney disease, bladder stones, or, in men, an enlarged prostate gland. Part of the Rooted Pixels Network.